Frost/Nixon is a 2008 British-American historical drama film based on the 2006 play of the same name by Peter Morgan, who also adapted the screenplay. The film tells the story behind the Frost/Nixon interviews of 1977. The film was directed by Ron Howard and produced for Universal Pictures by Howard, Brian Grazer of Imagine Entertainment and Tim Bevan and Eric Fellner of Working Title Films, and received five Academy Award nominations, including Best Picture, Best Actor, and Best Director. The film reunites its original two stars from the West End and Broadway productions of the play: Michael Sheen as British television broadcaster David Frost and Frank Langella as former United States President Richard Nixon. It was released in the United States on December 5, 2008, and in the United Kingdom on January 23, 2009. After the Watergate scandal of 1972 and his subsequent resignation in 1974, 400 million people worldwide watched Nixon leave the White House. Among them is British journalist David Frost, currently recording a talk show in Australia, who decides to interview Nixon. Nixon's literary agent, Irving Lazar, believes the interview would be an opportunity for Nixon to salvage his reputation, and to make some money. Lazar demands $500,000, and ultimately gets $600,000 and Frost accepts. After persuading his friend and producer John Birt that the interviews would be a success, Frost and Birt travel to California to meet with Nixon. On the plane to California, Frost flirts with a young woman called Caroline Cushing, and they begin a relationship. Frost struggles to sell the interviews to American networks, and decides to finance the project with private money and syndicate the broadcast of the interviews. He hires two investigators — Bob Zelnick and James Reston Jr. — to help him prepare, along with Birt. Frost is not clear on what he wants from the interview, and Reston encourages him to aim for a confession from Nixon. Under scrutiny by Nixon's post-presidential chief of staff, Jack Brennan, Frost and Nixon embark on the first three recording sessions. Frost is restricted by an agreed-upon timeframe and, under pressure from his own team, attempts to ask tough questions, but Nixon dominates the sessions regarding the Vietnam War and his achievements in foreign policy. Behind the scenes, Frost's editorial team is nervous about the interviewer's technique and angry that Nixon appears to be exonerating himself. Four days before the final session, which will center on Watergate, Frost receives a phonecall from an inebriated Nixon. In a drunken rant, Nixon declares that they both know the final interview will make or break their careers, and compares himself to Frost, insisting that they both came from humble backgrounds and had to struggle to make it to the top of their fields, only to be knocked back down again. Frost gains new insight into his subject, while Nixon assures Frost that he will do everything in his power to emerge the victor from the final interview. The conversation spurs Frost into action. He works relentlessly for three days to prepare, while Reston pursues a lead at the Federal Courthouse in Washington. As the final recording begins, Frost ambushes Nixon with damning transcripts of a conversation between Nixon and Charles Colson that Reston dug up in Washington. As his own team watches in horror from an adjoining room, Nixon admits that he did unethical things, adding, "When the President does it, that means it's not illegal." A stunned Frost is on the verge of inducing a confession when Brennan bursts in and stops the recording. After Nixon and Brennan confer, the interview resumes, Frost aggressively pursues his original line of questioning, and Nixon admits that he participated in a cover-up and that he "let the American people down." After the interview, Frost and Caroline pay a farewell visit to Nixon at his villa. Frost thanks Nixon for the interviews and Nixon, graciously admitting defeat, thanks Frost in return and wishes him well, privately adding that he has no recollection of calling Frost while drunk. He also for the first time addresses Frost by his first name. Nixon watches Frost and Caroline Cushing leave and then leans over a railing of his villa, looking out at the sunset. An epilogue states that the interviews were wildly successful and that Nixon never escaped controversy until his death in 1994. Sam Rockwell as James Reston Jr.
Other figures and personalities depicted in the film include Tricia Nixon Cox, Michael York, Hugh Hefner, helicopter pilot Gene Boyer (as himself), Raymond Price, Ken Khachigian, Sue Mengers and Jay White as Neil Diamond. To prepare for his role as Richard Nixon, Frank Langella visited the Richard Nixon Presidential Library in Yorba Linda, California, and interviewed many people who had known the former president. On the set, the cast and crew addressed Langella as "Mr. President." Frost/Nixon had its world premiere on October 15, 2008 as the opening film of the 52nd annual London Film Festival. It was released in three theaters in the United States on December 5 before expanding several times over the following weeks. It was released in the United Kingdom and expanded into wide status in the United States on January 23, 2009. The film was released on DVD and Blu-ray on April 21, 2009. Special features include deleted scenes, the making of the film, the real interviews between Frost and Nixon, the Nixon Presidential Library and a feature commentary with Ron Howard. Frost/Nixon had a limited release at three theaters on December 5, 2008 and grossed $180,708 in its opening weekend, ranking number 22. Opening wide at 1,099 theaters on January 23, 2009, the film grossed $3,022,250 at the box office in the United States and Canada, ranking number 16. The film's gross for Friday, January 30 was estimated the next day at $420,000. Frost/Nixon grossed an estimated $18,622,031 in the United States and Canada and $8,804,304 in other territories for a total of $27,426,335 worldwide, recouping its $25 million budget by a thin margin. On review aggregation website Rotten Tomatoes, the film has an approval rating of 93% based on 254 reviews, with a weighted average score of 8/10. The site's critical consensus reads, "Frost/Nixon is weighty and eloquent; a cross between a boxing match and a ballet with Oscar worthy performances." Metacritic gives the film an average score of 80 out of 100, based on 38 critics, indicating "generally favorable reviews". Critic Roger Ebert gave the film four stars, commenting that Langella and Sheen "do not attempt to mimic their characters, but to embody them." Peter Travers of Rolling Stone gave the film 3½ stars, saying that Ron Howard "turned Peter Morgan's stage success into a grabber of a movie laced with tension, stinging wit and potent human drama." Writing for Variety, Todd McCarthy praised Langella's performance in particular, stating, "[B]y the final scenes, Langella has all but disappeared so as to deliver Nixon himself." René Rodríguez of The Miami Herald gave the film two stars and commented that the picture "pales in comparison to Oliver Stone's Nixon when it comes to humanizing the infamous leader" despite writing that the film "faithfully reenacts the events leading up to the historic 1977 interviews." Manohla Dargis of The New York Times said, "[S]tories of lost crowns lend themselves to drama, but not necessarily audience-pleasing entertainments, which may explain why Frost/Nixon registers as such a soothing, agreeably amusing experience, more palliative than purgative." Both the film and the play take dramatic license with the on-air and behind-the-scene details of the Nixon interviews. Jonathan Aitken, one of Nixon's official biographers who spent much time with the former president at La Casa Pacifica, rebukes the film for its portrayal of a drunken Nixon making a late-night phone call as never having happened and says it is "from start to finish, an artistic invention by the scriptwriter Peter Morgan." Director Ron Howard discussed the scene in detail on his feature commentary for the DVD release, pointing out it was a deliberate act of dramatic license, and while Frost never received such a phone call, "it was known that Richard Nixon, during ...the Watergate scandal, had occasionally made midnight phone calls that he couldn't very well recall the following day." Aitken recalls that "Frost did not ambush Nixon during the final interview into a damaging admission of guilt. What the former president 'confessed' about Watergate was carefully pre-planned. It was only with considerable help and advice from his adversary's team that Frost managed to get much more out of Nixon, in the closing sequences, by reining in his fierce attitude and adopting a gentler approach." Elizabeth Drew of the Huffington Post and author of Richard M. Nixon (2007) noted some inaccuracies, including a misrepresentation of the end of the interviews, the failure to mention the fact that Nixon received 20% of the profits from the interviews, and what she says are inaccurate representations of some of the characters. Drew points out a critical line in the movie that is particularly deceptive: Nixon admitted he "'...was involved in a 'cover-up,' as you call it.' The ellipsis is of course unknown to the audience, and is crucial: What Nixon actually said was, 'You're wanting me to say that I participated in an illegal cover-up. No!'" David Edelstein of New York wrote that the film overstates the importance of its basis, the Frost interviews, stating it "elevates the 1977 interviews Nixon gave (or, rather, sold, for an unheard-of $600,000) to British TV personality David Frost into a momentous event in the history of politics and media." Edelstein also noted that "with selective editing, Morgan makes it seem as if Frost got Nixon to admit more than he actually did." Edelstein wrote that the film "is brisk, well crafted, and enjoyable enough, but the characters seem thinner (Sheen is all frozen smiles and squirms) and the outcome less consequential." Fred Schwarz, writing for the conservative National Review online, said that, "Frost/Nixon is an attempt to use history, assisted by plenty of dramatic license, to retrospectively turn a loss into a win. By all accounts, Frost/Nixon does a fine job of dramatizing the negotiations and preparation that led up to the interviews. And it’s hard to imagine Frank Langella, who plays a Brezhnev-looking Nixon, giving a bad performance. Still, the movie’s fundamental premise is just plain wrong." Though generally approving, critic Daniel Eagan notes that partisans on both sides have questioned the accuracy of the film's script. Caroline Cushing Graham, in a December 2008 interview, noted that her first trip with Frost was to the Muhammad Ali fight in Zaire, and that the two had been together for more than five years prior to when the film shows the two meeting. She remembered Frost as feeling that he did a pretty good job on every interview, whereas the film depicts him feeling he did a poor job with the first two interviews. She added that while the movie shows Frost driving, in fact they were always chauffeured because he was always making notes for the work he was doing. 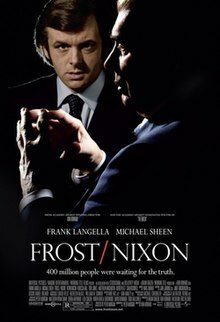 The film implies that Nixon and Frost were meeting for the first time in 1977 for these interviews, but in fact Frost had interviewed Nixon for U.S. network television in 1968 as part of a series of interviews of leading candidates in the Presidential election of that year. Diane Sawyer, portrayed in the film in her role as one of Nixon's researchers, said in December 2008 that, "Jack Brennan is portrayed as a stern military guy," citing both the play and what she'd heard about the film version. "And he’s the funniest guy you ever met in your life, an irreverent, wonderful guy. So there you go. It's the movies." An early scene in the film set on the southern shore of Sydney Harbour in 1974, with the Sydney Opera House as a backdrop, shows buildings adjacent to the iconic structure which did not exist until 1998. ^ a b "Frost/Nixon (2008)". Box Office Mojo. Retrieved 2009-04-21. ^ McGrath, Charles (December 31, 2008). "So Nixonian That His Nose Seems to Evolve". The New York Times. Retrieved 2009-01-22. ^ "Froxt/Nixon — Daily Box Office Results". Box Office Mojo. Retrieved 2009-01-19. ^ a b "Frost/Nixon Gets Political on DVD and Blu-ray on April 21st". 20 February 2009. ^ a b "Frost/Nixon (2008) – Weenend Box Office". Box Office Mojo. Retrieved 2009-01-28. ^ McClintock, Pamela (January 31, 2009). "Box office crown 'Taken' by Fox". Variety. Retrieved February 1, 2009. ^ "Frost/Nixon (2008)". Box Office Mojo. Retrieved 2009-02-09. ^ "Frost/Nixon". Rotten Tomatoes. Retrieved 2010-11-13. ^ "Frost/Nixon (2008):Reviews". Metacritic. Retrieved 2009-04-21. ^ Roger Ebert (2008-12-10). "Frost/Nixon — Roger Ebert". Chicago Sun-Times. Retrieved 2008-12-13. ^ "Frost/Nixon Review — Rolling Stone". Rolling Stones. 2008-11-12. Retrieved 2011-03-10. ^ Todd McCarthy (2008-10-15). "Review: "Frost/Nixon"". Variety Magazine. Retrieved 2009-01-27. ^ Dargis, Manohla (December 5, 2008). "Movie Review Frost/Nixon (2008)". The New York Times. Retrieved January 28, 2009. ^ "Where Hollywood Meets History: Frost/Nixon". BU Today. Boston University. November 17, 2008. Retrieved 2010-08-28. ^ a b Ron Howard (director) (2009). Frost/Nixon (Feature commentary) (DVD). Universal Studios Home Entertainment. Event occurs at 1:19:10 - 1:24:46. ^ a b Aitken, Jonathan (January 24, 2009). "Nixon v Frost: The true story of what really happened when a British journalist bullied a TV confession out of a disgraced wx-President". The Daily Mail. Retrieved 2009-01-29. ^ "Frost/Nixon: A Dishonorable Distortion of History". Huffington Post. 2008-12-14. Retrieved 2008-12-23. ^ "Frost/Nixon's Self-Congratulatory Revisionism". The National Review Online. 2008-12-05. Retrieved 2008-12-27. ^ "Film Review: Frost/Nixon". Film Journal International. Retrieved 2009-01-23. ^ Miriam Datskovsky (December 6, 2008). "Dating David Frost". The Daily Beast. ^ Lynn Sherr (December 6, 2008). "Diane Sawyer on Fact vs. Fiction in Frost/Nixon". The Daily Beast.